After watching Brazil come back from 2-0 to beat the US 3-2 in soccer last weekend, I got an itch to try some Brazilian BBQ. If figured if I can't rejoice in victory, at least I can enjoy the food they'll serve at their parties! This Brazlian chicken is really tender and delicious...and uses beer, one of my favorite BBQ ingredients. You won't be disappointed! Put chicken and marinade in a large ziplock back, remove air, and seal. Refrigerate for at least 6 hours, preferably up to 2 days. Preheat grill on high on one side and medium on the other. 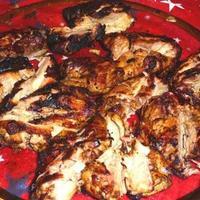 When ready to cook, remove chicken from marinade and reserve excess marinade. Season generously with kosher salt. Oil the grill grate and arrange chicken skin side down on hot side of grill. Cook about 4-5 minutes or until charcoal starts to flame. Move to the cooler side and continue grilling another 6-7 minutes until skin is nicely browned. Turn the pieces skin side up and move back to the hotter side. Brown the underside well, about 4-5 minutes, then move back to the cooler side to finish grilling for about 6-7 mintues. Total cooking time will be 20-24 minutes, and chicken will be cooked to perfection! (This cooking method tip is adapted from The Barbecue Bible). Transfer to a serving plate and serve immediately! I really enjoyed this tender, mild, but flavorful chicken. Our kids loved it too!! This chicken is awesome. A great flavor, and just the right amount of kick. Well done John. I like this. Looks so tasty and i think i can do it with a few tries.